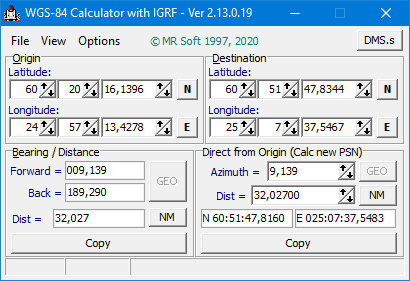 WGS-84 Calculator is used to calculate geodetic distance and azimuth between two points (latitude and longitude). In addition, it can calculate a new point from origin using the given azimuth and distance. 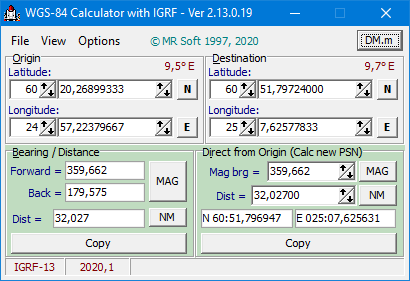 Version 2.11 includes IGRF-12 magnetic model, program calculates magnetic declination for both points and gives results also as magnetic bearings. 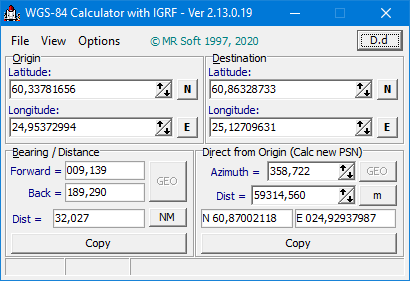 Declination is calculated using altitude 0.0 m MSL and selected date. Magnetic bearing could be used also when calculationg a new point. Calculations are based on WGS-84 (World Geodetic System - 1984) co-ordinate system, which is used for example in aviation. Result can be copied to Windows clipboard and then used in other Windows programs. The WGS-84 Calculator program is very easy to use. Co-ordinate format can be selected from three different format (DD:MM:SS.ssss, DD:MM.mmmmmm or DD.dddddddd). Copyright © 2017, 2018 MR Soft Tmi. All Rights Reserved.